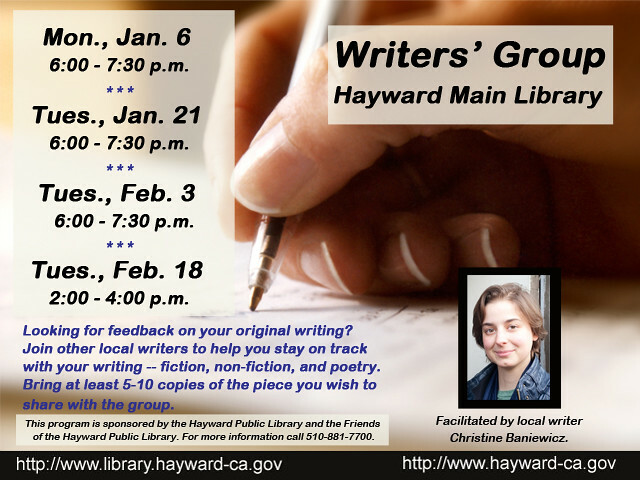 Tuesday, January 21, 6:00-7:30 p.m.
Monday, February 3, 6:00-7:30 p.m.
Tuesday, February 18, 6:00-7:30 p.m.
Get feedback on your original writing in a peer-supported writers’ group facilitated by Bay Area writer and community theater artist Christine Baniewicz. Get the support you need to help you stay on track with your writing, whether it’s fiction, non-fiction, or poetry. Bring 5-10 copies of the piece you wish to share with the group. Christine Baniewicz has a bachelor’s degree from Louisiana State University and is currently working on a book-length memoir on fellowship at the San Francisco Writers’ Grotto. Sponsored by the Friends of the Hayward Public Library.